Before Spencer left, he sent me a link to a New York Times article that listed 101 simple summer salads. You see, Spencer knows that I barely know how to heat up water without starting a fire and that my cream of mushroom soup mysteriously tasted like bananas. This list was his attempt at saving me from starvation in his absence. And, indeed, a lot of these recipes are fairly easy, not to mention tasty and a little weird in the way I tend to enjoy. I hate to quibble with Mark Bittman, but I wouldn’t call the end result astonishing, necessarily. 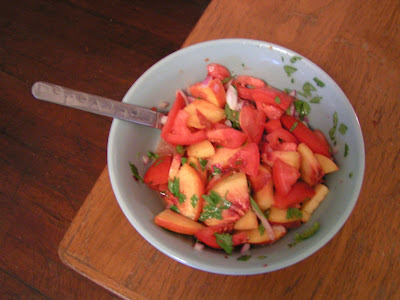 As you might expect, it tastes a lot like peach salsa, only composed of larger chunks o’ produce. However, it was pretty good — and considering that it was easy enough to make that even stupid me could do it, I think that kicks up the overall evaluation to pretty damn good. And please excuse my poor food photography. It turns out I’m about as bad a food picture-taker as I am a cook. My salad mission, however, continues. Eesh...I would think peaches and tomatoes were too similar to be mixed...but who knows. Maybe I'd be ASTONISHED by the results.